Ever notice, when you are in a selling situation, everybody in the room has their defenses up? You are in your sales zone, pressing forward, focused on including every feature and benefit your asphalt paving delivers, alert for objections. Your prospect is in his or her buyer zone, wanting to find out as much as possible, while keeping options open and making sure there will be no “buyer’s remorse” at the end of the road… or driveway. Ever wonder what it might be like to somehow play the sales game in a whole new ballpark? This technique is not for the faint of heart. But what if you became an asphalt educator, champion and guru instead of a seller of asphalt products and services? This approach requires a fundamental shift in your basic attitude. Instead of a service provider, your No. 1 focus is to become an educator whose primary goal in life is to spread the good word about asphalt. If you can authentically adopt this new attitude, and not just “pretend” it, you might find your bottom line in a steady growth trend. Your first goal is to educate yourself about potential customers. Instead of just trying to pry out when they might be ready to hire you, instead, focus on finding out about their ideas and plans. What’s on their mind? What’s causing them stress or worry? There is no particular script for this type of conversation. The most important thing you do here is to listen with great care. When you’re really listening, your curiosity begins to activate. You find there are more questions you want to ask, threads to follow, points where you want clarification. None of these things happen during a sales pitch. You must also be informative and interesting to the point where you pique the curiosity of your prospect. Successful small business owners are passionate about what they do. They have interesting stories to tell about how they got started, what draws them to do what they do. As you engage in these qualifying conversations, where you discover who might – and who might not – be a good potential customer, always remember that some people are just never going to be your asphalt customers. No matter what. Ranging from geographical constraints to budgetary impossibilities, some people are never going to give you business. On the other hand, you never know where the next referral might originate. In one case, a man worked in the back shop of a printing company, and was treated shabbily there – promised raises were not forthcoming, and they were disrespectful of this man’s time. A year later, the man found a job at a growing corporation. Not surprisingly, because of his printing background, he was working in the department that bought printing for the corporation. Whenever anyone suggested using that print shop, he dismissed the idea, and was respected. The print shop’s shabby treatment of this man, including denying him the $1 per hour raise they promised, ended up costing them thousands upon thousands of dollars – and they never knew it. In business, many owners stifle their potential by selling, selling, selling all the time. Staying in the prospecting zone as much as possible removes considerable pressure. Certainly, prospectors are looking for customer gold. And in fact, once the prospect is qualified as customer gold, the sales process becomes merely an exercise in order-taking. Prospectors are tossing out seeds, planting the idea of their company in prospect’s minds. This is especially true in the asphalt business, where sales cycle times are all over the map. A conversation you have today might result in a contract next year. 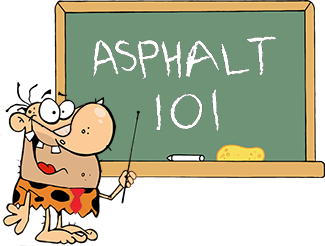 Asphalt paving is generally not an impulse purchase. The decision is yours, how much of your day should be spent prospecting v. selling? Only you know your situation best. Ask questions, ask more questions, then find yet more questions to ask. You’re just looking for a fit. If there’s a fit, the sale will follow. You’ll find this approach can bring you more customers and less stress, if you do it honestly and never, ever let them see you sweat.